The documents, photos and other items stored in the Archives are an astounding mosaic of records that tell the story of America’s journey from a fledgling nation to a world leader. Before the establishment of the Archives, key documents, photos and other papers were stored in a haphazard manner by various governmental agencies. With no place to safeguard historic artifacts, many were misplaced or lost to fires. Although there were numerous demands for a more effective and organized hall of records, Congress did not take action until 1926. Over the next several years, a commission reviewed design proposals and selected a location for the building. A Classical Revival-style edifice designed by John Russell Pope was chosen for construction on Pennsylvania Avenue between Seventh and Eighth Streets. President Herbert Hoover helped lay the cornerstone in 1933. Because the building is situated above an underground stream, more than 8,500 piles had to be driven into the ground to support the concrete bowl foundation. Congress authorized the use of limestone or granite as building materials. As construction was taking place during the Great Depression, suppliers of both stone materials lobbied for the contract. A compromise was reached that used granite for the building’s base and limestone for the superstructure, which was similar to the combination used on other buildings in the area known as the Federal Triangle. The construction process took two years as the building required special air handling systems, filters and shelving to meet archival standards. The building opened to the public in November 1935. The historic edifice has been renovated and modernized several times since then. This includes the replacement of the hermetically sealed encasement for the Charters of Freedom. First displayed in the Rotunda in 1952, the exhibits had to be replaced 50 years later due to deterioration. The new displays feature special scanning equipment designed by the Jet Propulsion Laboratory that continually monitors the condition of the Charters. The Archives’ exhibit space was increased from 12,000 square feet to more than 19,000 in 2013. While looking at documents and photos may sound boring, the Archives has created a fun and entertaining interactive child-friendly museum that includes computer terminals, listening booths and video displays. Some exhibits are modeled after games and mysteries. In addition to special and temporary exhibits, the Archives house a number of permanent galleries. The cathedral-like Rotunda of the National Archives is the setting for the encasements displaying the Charters of Freedom as well as 14 other displays chronicling their creation and ongoing national and international influence. The David M. Rubenstein Gallery hosts the Records of Rights exhibit that features one of the few known copies of the Magna Carta. Signed by Edward I, this document was the basis for English Law, which set the stage for the U.S. Constitution. The exhibit also traces the history of the Civil Rights Movement, including a working copy of the Civil Rights Act of 1964. The Public Vaults highlight portions of the immense number of artifacts stored by the Archives. The gallery’s documents, papers, photos and audio clips are designed around five themes. You can obtain information on your family’s heritage, the rule of law and the nation’s common defense as well as the exploration and the preservation of the past. In addition to the sacrifice and heroism of service members, displays highlight human ingenuity, the path to U.S. citizenship and the passage and modification of laws. The Archives also provides advice on how you can preserve your own family records. Items on display include census records, draft cards, the debate over Prohibition and records of polar explorations as well as the Civil War records of the 54th Massachusetts Infantry and recordings of Oval Office discussions during the Cuban Missile Crisis. The Lawrence F. O’Brien Gallery highlights how the Constitution is amended as well as the petitions, landmark documents and other political influences that have addressed issues like child labor, women’s suffrage and civil rights. The William G, McGowan Theater is a 290-seat state-of-the-art facility showing films that document the real life relationship between people, democracy and the documents stored in the Archives. The East Rotunda Gallery features a rotating exhibit that focuses on a unique document in American history, such as the 1866 Civil Rights Act, the legislation creating the National Park Service, military records related to the Tuskegee Airmen and the patent for the Coca-Cola bottle. The Boeing Learning Center provides a hands-on learning experience for children. Washington, D.C. attracts millions of visitors each year. The best times to visit are from March to May as well as September to November. Spring features the profusion of cherry blossoms along the Tidal Basin. Autumn brings the colorful fall foliage. While summertime is the high tourist season, it also brings sweltering temperatures and humidity. Washington, D.C. winters are generally mild but can bring freezing temperatures and the potential for snow so pack accordingly. The busiest times to visit the Archives are during March, April and May because many school field trips occur during this period. Other busy times include the Thanksgiving weekend and the week between Christmas and New Year’s. You can skip the lines by making a reservation for a timed entrance self-guided tour a minimum of six weeks in advance. Another option is to try to join the one guided tour that is offered at 9:45 a.m. each day Monday through Friday. Print and bring a copy of your reservation with you that includes all the names in your party. Arrive at least 10 minutes before your timed entrance. All visitors are subject to security screenings so avoid carrying backpacks or other large bags. You should avoid wearing jewelry or other metal objects that could set off the detector. Eating, drinking and taking pictures is prohibited inside the Archives. The archives museum is located on the National Mall in the heart of downtown Washington, D.C. While the research entrance is located off Pennsylvania Avenue, the main Rotunda entrance is found on Constitution Avenue. There is only limited metered street parking near the building. While there is a Metro stop serving the Green and Yellow Lines a block away, the most convenient way to reach the National Archives is the Old Town Trolley. Why navigate congested streets or travel underground and miss the sights of the nation’s capital when you can enjoy a relaxing ride on a stadium trolley. View the sights and hear an entertaining and informative narration from America’s Storyteller about the major points of interest within the District. Hop off the trolley and tour the Archives and nearby attractions at your leisure. When you are finished, hop aboard the next trolley that comes by. Dozens of monuments, memorials and other museums surround the building. The White House and U.S. Capitol are located a short distance away. There are also a few popular attractions located within a block of the National Archives. 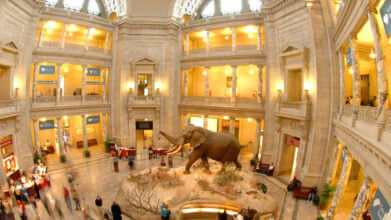 The National Museum of Natural History is the largest and most-visited institution of its kind in the world. In addition to exhibits focusing on Darwin’s Theory of Evolution, the museum shares the story of the planet, dinosaurs and the oceans. It also displays rare objects like the Hope Diamond. The institution also hosts an IMAX theater and a student-friendly interactive Discovery Room. The National Gallery of Art and its adjacent sculpture garden house a collection that traces Western Art from the Middle Ages to the present day. The 75,000-piece collection includes works by Rembrandt, Picasso and Gauguin as well as Leonardo da Vinci, El Greco and Gilbert Stuart. The Newseum is an interactive museum that chronicles the history of print, photo and broadcast journalism. The 250,000-square-foot museum has seven levels, 15 galleries and 15 theaters that include one of the largest displays of the former Berlin Wall. Exhibits feature coverage of today’s headlines, key moments in history and topics like free speech and freedom of the press. U.S. Navy Memorial Plaza honors the men and women who have served in America’s sea service. The plaza includes the famous Lone Sailor statue by Stanley Bleifeld. The statue overlooks the Granite Sea, an accurate replication of the world’s major oceans. In addition to two fountains, the plaza also contains 26 bronze reliefs commemorating key personnel and events.